Odisha’s gross state domestic product (GSDP) is projected to grow at the rate of 7.14 per cent in 2017-18, higher than the national average of 6.5 per cent, says the state’s Economic Survey. The survey goes on to point that the state economy in 2016-17 expanded by a striking 10.39 per cent, according to the first Revised Estimates. Odisha has shed the tag of a laggard state and is exhibiting strong catch-up growth, helping in the transformation of the economy. The survey attributed the growth trajectory of the state over the last five years to several development initiatives and prudent macro-management of the economy. “A structural shift is visible, but it is largely on account of a shrinking share of industrial sector in the state. At present, services account for 45 per cent of GSDP, industry 35 percent, and agriculture sector about 20 percent,” the survey added. 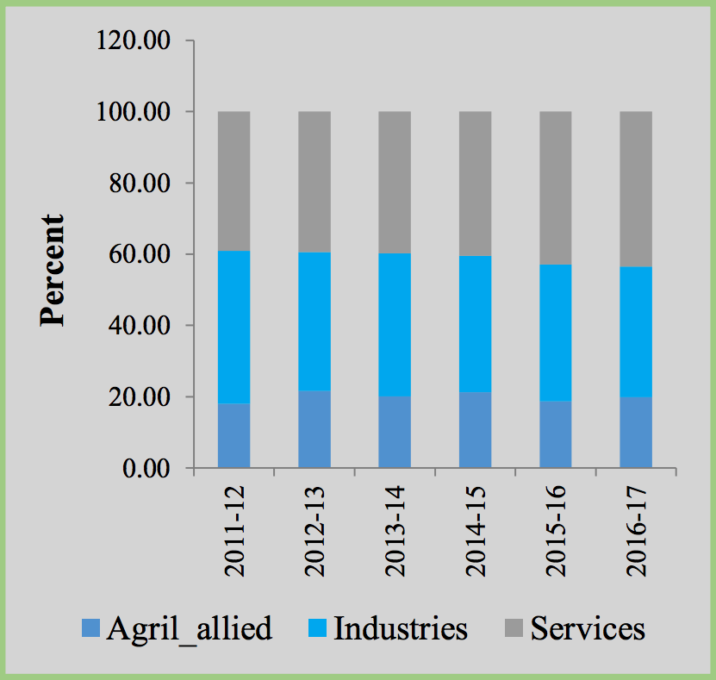 Apart from the shrinking share of industries to state GSDP, the survey listed agriculture’s imposing share of 62 per cent to the total unorganised workforce as an area of concern. The survey noted that the share of industry to state GSDP has declined from 43.6 per cent in 2011-12 to 34.8 per cent in 2017-18 even as the mineral-rich state has huge potential for industrialisation. During 2017-18, mining, manufacturing, and construction sectors are estimated to record moderate growth of 4.6 per cent. On the contrary, sub-sectors like electricity, water supply, and other utility services are expected to grow higher at the rate of 9.6 per cent. 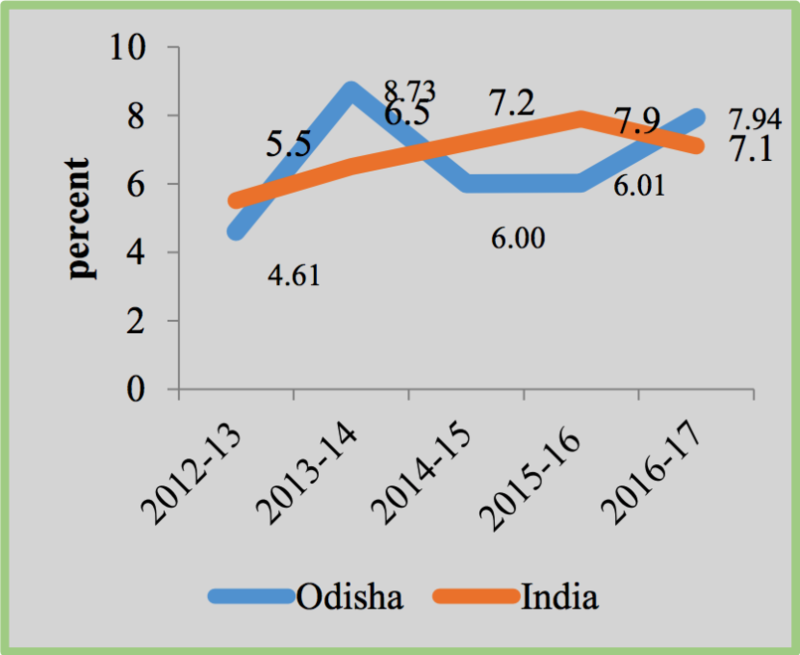 Over the past five years, Odisha’s industry sector has logged compound annual growth rate of 5.72 per cent per annum. For agriculture, 2016-17 was an unprecedented year, with the sector expanding by nearly 20 per cent after de-growth of 13 per cent in 2015-16. The high growth was largely on account of vagaries of weather and also the low base. Between 2011 and 2017, Odisha’s agriculture sector has logged average annual growth of 2.8 per cent. Services sector in Odisha has grown in line with all-India trends. In 2016-17, the sector witnessed an accelerated growth rate of 10.7 per cent and is estimated to grow at 12.4 per cent in 2017-18. Trade, transport, and other services sub-sectors grew by 12 percent, 14 percent and 13 percent, respectively, in FY17. Financial services, despite having a low share of 4 per cent of GSDP, saw a growth rate of 9.7 per cent in 2016-17 and is estimated to grow at 10.7 per cent in 2017-18.